Agios Nikolaos is a lovely town, which is located in the beautiful Mirabello bay in the eastern part of Crete. Heraklion Airport is located approx. 80 km away. 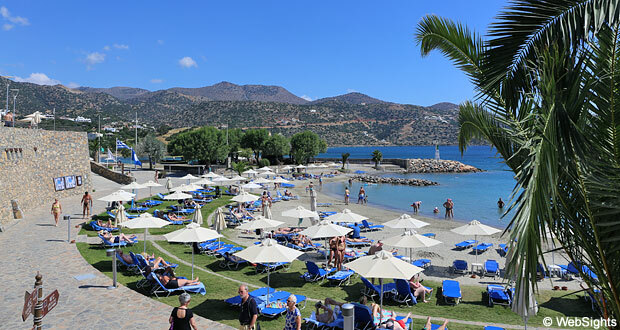 Agios Nikolaos has 3-4 small beaches scattered around the town. Even the 70 m long main beach, Kitroplatia, is not very large. It is located in a small bay and is surrounded by houses and charming restaurants. The beach is covered with coarse sand mixed with quite many rocks. The water is incredibly clear, but deepens relatively fast. It is possible to rent sun lounges and sunshades at the beach and there are also showers. You can park in the streets next to the beach, but this can be quite a challenge. The name of the beach, Kitroplatia, actually means ‘lemon square’ in Greek. It got this name due to the lemon trade that took place at the beach many years ago. There are many rocks at the beach and the water deepens rather abruptly. Therefore, the beach is not very child-friendly. 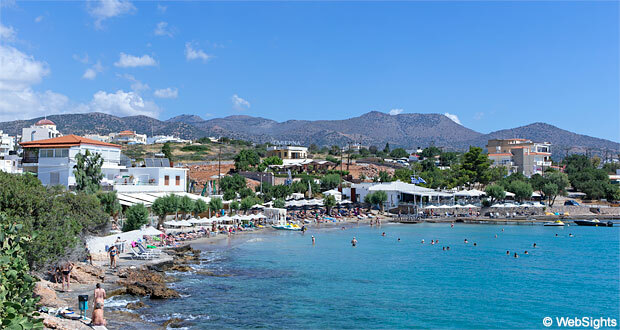 There are no water sports activities at the main beach in Agios Nikolaos. Moreover, there are no activities at the other beaches in town. There are many restaurants/cafés near the beach. There is also a beach bar on the beach. 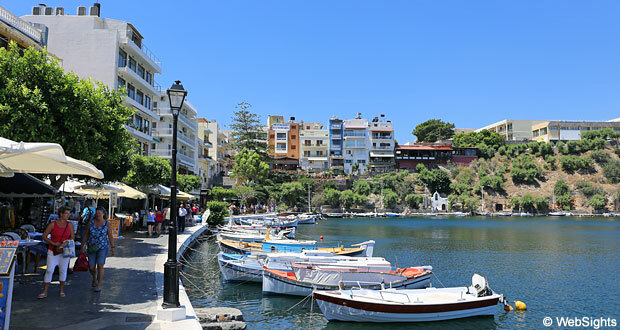 Agios Nikolaos is a nice and relaxed town, which has managed to maintain its Greek charm. The town is ideal for lovely strolls along the coast, around the lake or in the many shopping streets by the harbour. The distinctive feature of the town is the small lake in the middle of the town, which was thought to be bottomless for a very long time. Now it is the town’s centre of tourism. 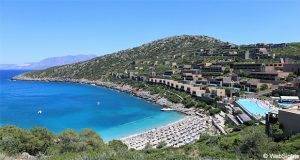 One kilometre south of the town, you will find the very popular sand beach Almiros, which many of the tourists from Agios Nikolaos go to. 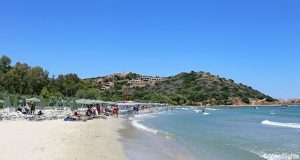 The just as popular sand beach Ammoudara is located a bit further to the south. The main beach, Kitroplatia, can be seen in the bottom right corner of the map. Lake Voulismeni can be seen in the middle of the picture. The popular sand beaches Almiros and Ammoudara are located a bit further to the south.